The weather was amazing:) Clear blue skies, calm waters and very hot! My one regret was not being able to swim off the marina! Next day Ron’s cheap taxi man picked me up to take me shopping! This is always an out of this world experience as they do everything for me… carry the shopping bag, barter with the seller, pick the best produce, find what you are looking for and can’t find! It is kind of hard to accept but really helpful! So, Vodafone for sims, produce markets for fruit and veg, butcher for meat and supermarket for the rest! The produce was quite depleted of some things due to the cyclone, especially bananas! Our favourite! But still all that I needed:) All done but it took 4 hours!! Headed out of the marina the next day and set sail for Musket Cove. We decided to plan our route with the wind to save money on fuel so that appeared to be the best way to go… Midway across the wind changed! We continued to Musket Cove anyway, dropped the anchor and enjoyed an evening with sea breezes once out of the marina. Having arrived late afternoon I did not feel like a swim so 3 days in Fiji and yet to get in the water! The next day we changed our plans and headed back where we had come from to Lautoka. I finally had a swim! It was divine! The water temperature is 26degs so almost a bath but I just love getting in the salt water! Magic! I felt as though I had finally arrived! First stop was a 42NM motor sail through a channel with coral reefs and sandbanks either side to an anchorage for the night. It was a very hot and sunny day with light winds. Took about 7 hours with Ron catching a Wahu on the way! The next morning we had a big day ahead of us so we left about 6.30 to go through the Nananu Passage through the outer reef to make our way to the second biggest island in Fiji, Vanua Levu. 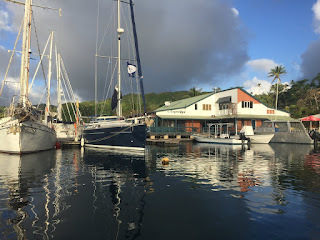 The conditions were perfect for sailing so Ron and I put the mainsail and jib up, turned off the motors and made a 10 hour sail across the Bligh Water, through the Vatu-I-Ra Channel and into Wainunu Bay on the island of Vanua Levu. Although we took turns at the helm, we had a couple of passages to navigate and Ron needed me to look out for coral bombies so for a large part of the hottest part of the day, Ron was at the helm. That night Ron suffered from disorientation and confusion and was unable to get his words out:( It was very scary! We had no internet to be able to confirm but I was pretty sure he was suffering from heatstroke. It was the second time this had happened to him, both times after being out in the sun on a hot day. He rehydrated, took some panadol, had a shower and felt a lot better. We know to watch out for this in the future and in particular, to keep his fluids up! Once again we needed to make an early start the next morning as we wanted to go through the Nasonisoni Passage through the reefs while the tide was still high and the winds still only at 12 knots. The forecast had predicted winds to increase to 18knots and we didn’t want to come out of the narrow passage to huge swells. It was an uneventful passage and although we experienced significant rise and fall at the ocean end, it did not affect us. I had read a blog where the skipper had said it was their toughest passage yet so we were apprehensive! 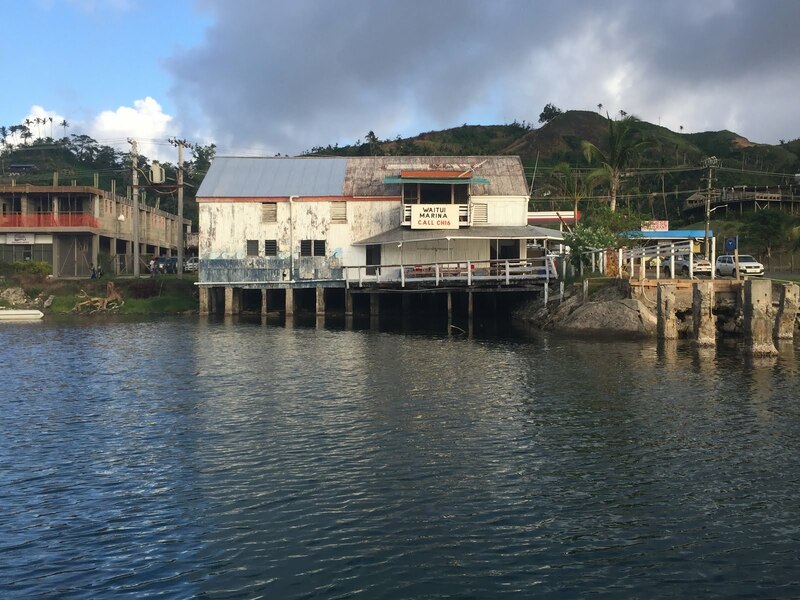 Once through it was a 4 hour motor sail to Savusavu, a clearance port and very safe harbour. Unfortunately the wind was just off the nose so we pointed as high as we could with the jib up and kept the revs down to 1500 and got along about 6 knots. We dropped anchor, had a swim and have settled in ever since! It is very pretty here. There are 2 marinas, one quite derelict with mooring buoys and the other quite fancy but a bit pretentious. You can anchor at the entrance or further up past the marinas in the creek. We have stayed out towards the entrance. There is a nice breeze and we can see all the comings and goings! There has been a strong wind warning in force and the winds have been up since we arrived on Sunday so there are boats coming in all the time! It is fascinating! 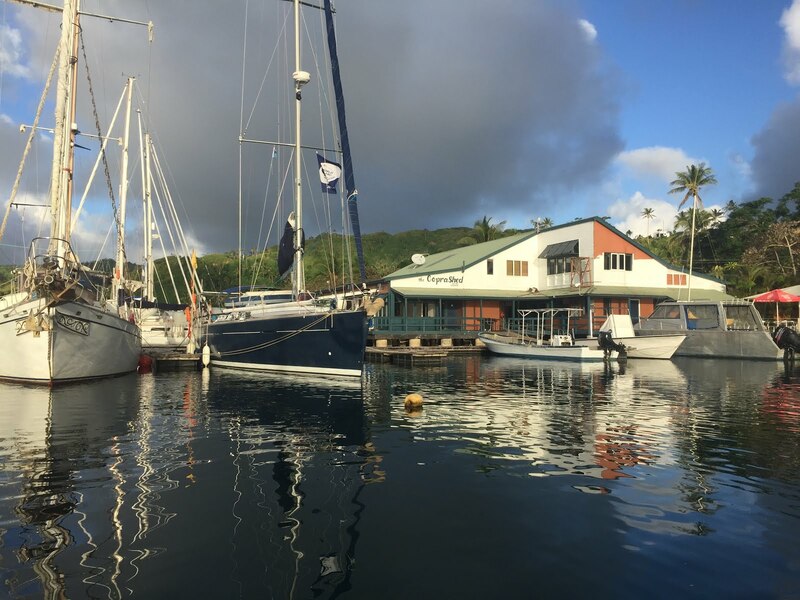 As Savusavu is a clearance port, many are coming from Tonga and NZ:) Others are just coming in for shelter from the wind. 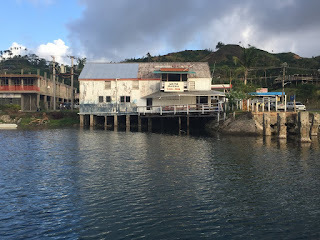 The town is very pretty along the waterfront and the stores have all that you would ever need but they are typical island shops with unpainted shop fronts with little or no windows and very crowded narrow aisles. The people are SO lovely:) They all greeted me on the street, are softly spoken and their smiles light up the world! There does not appear to be too much damage from the cyclone here but there are 3 or 4 sunken boats:( It is the villages on the outer islands which have been most affected:( Some completely wiped out, others 3 or 4 houses…. 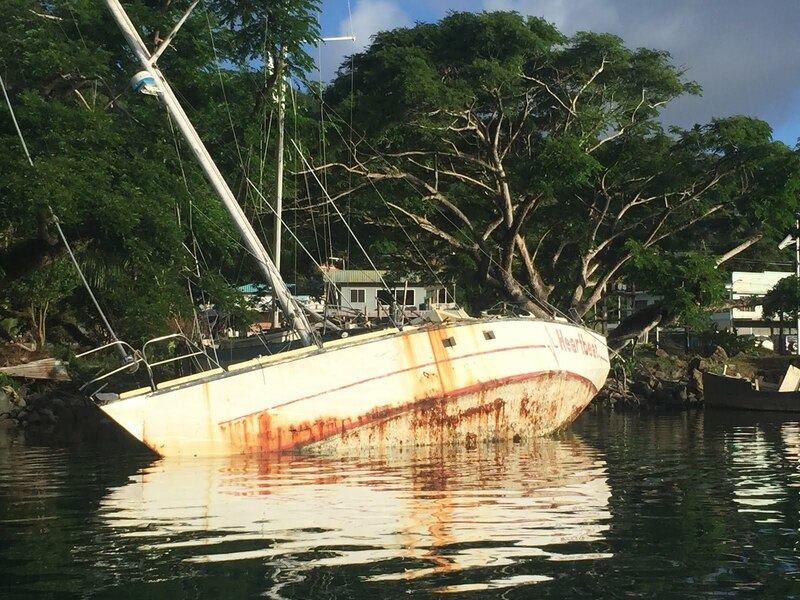 We later learned that 22 boats escaped their moorings and were washed ashore. Our plan is to stay here until the weather has improved sufficiently to sail 40 miles North to Viani Bay where the snorkelling is meant to be out of this world.